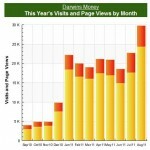 May was a pretty good month for blogging from a traffic and income standpoint. 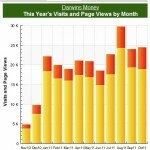 At Darwin’s Money specifically, I was able to break 20,000 page views for the month, which is a nice bump from where I was at a few months ago, but it hasn’t been growing since I first broke 20,000 earlier this year. 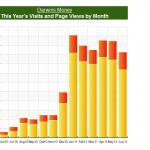 And looking at this chart, I just realized, I’m approaching 1 year on this blog! and More... I have a few other sites and projects going on. For specifics on how I make money online, check out The Economics of Blogging (5 Figure Side Job) and Economics of Blogging (How I Make Money). I’ve started to become more transparent with blogging income, but I’m not providing specific numbers for total online income for a few reasons. Primarily, I have a lot of different stuff going on, some of which involving partners, so it’s not appropriate for me to share all those details. Next, it’s a lot of time to track, and put into writing. Finally, I have a lot of friends and family that read my stuff and it’s a little obnoxious to “brag” about what you’re making – to people I know at least. It’s a balance between being excited and sharing with my web community how I’m doing versus being a bit humble and appreciative about my success. 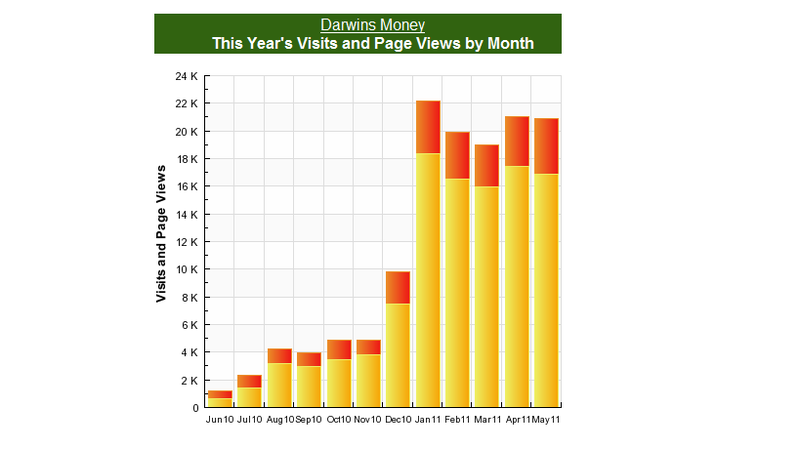 I think at a minimum, readers at Darwin’s Money will enjoy the traffic and earnings updates. I’ve provided some previous updates on a new business venture CAD-Sourcing.com. In essence, we employ a network of lower cost engineers and CAD drafters globally to service US firms primarily (hoping to expand)! Instead of paying a US CAD drafter something like $30-$60 an hour, we’re able to provide the same level of service and quality at $12/hour. It’s a win-win for everyone. This month, we had a few nice developments. We opened a new office in the Philippines and hired some new employees. Our office is up and running and we’re focusing on filling up our workload. We locked in a pretty steady large client, whose work may actually keep us busy for years. We’re also continuing to get smaller jobs somewhat consistently. For now, we’re driving a fair amount of traffic via Adwords, but I’ve been working on an SEO approach to achieve organic google search traffic. (So, if you want to link to our site, I’d be eternally grateful and reply in kind – just let me know (contact)! My partner and I are very excited about this business given the scalable nature of what we’re doing and the expertise we each bring. It’s a great team effort and while we’re plowing all revenues back into expansion, payroll and advertising, we expect to be clearing a few grand a month by the end of the year if all goes well. Now that I’ve “opened up” a bit more, I’ll be sharing more on my other online projects and perhaps what I’m doing will spur some collaborations or ideas on your part. If you enjoy these updates and want to stay in tuned with what I’m up to, make sure to subscribe to RSS or Email updates and/or Twitter . Very cool, I love hearing success stories and I really love hearing people building up their businesses. There’s nothing better than breaking out of the mold and being successful at something most people know nothing about! Thanks, sometimes I have to pinch myself; this blogging side-gig has really improved our financial outlook! You’ll be there in no time, your stuff is great! Man you’re doing really well with the Adsense! Congrats. I’ve never been able to make more than $200 a month with it. 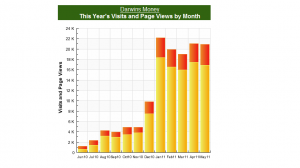 Adsense isnt’ always the best and people say it’s best to sell a product or whatever, but it’s workin’ for me now! This is awesome stuff. Congrats on your success so far! I’m tired and I’ve had a killer week, but it’s posts like this that help me keep up my motivation to keep generating ideas and spend time on working on extra projects. Congratulations on the success of your blog! Truly an inspiration. It can be difficult to keep going and coming up with new ideas, which is why I’ve never understood when people say blogging is “easy.” You really have to enjoy what you’re doing in order to make that kind of money because it takes a lot of work. If only everyone had that sort of sticktoitiveness, then we’d clear up the national debt in no time, right? Thanks for sharing the figures of your earnings – it puts things in perspective. Wow, all this looks great! The cad-sourcing idea is quite a good one, way to take advantage of cost of labor! INSPIRING. And congratulations, you are obviously doing lots right! Just signed up for your feed. I appreciate the candor.